Founder Heather Maclean Outlasts Competition; Is One of Sir Richard Branson's Final Four "Best Entrepreneurs"
Little Laureate Series Voted One of "BEST BABY VIDEOS OF ALL TIME" by Parents Magazine The Little Laureate series was recently voted #3 of the Best Video Series for Babies of All Time by readers of Parents magazine. Ranking just behind Disney and Elmo, Little Laureate outranked all other toddler series on the market, including Brainy Baby (#10), Baby Songs (#9) and LeapFrog (#5). The video was featured in the September 2004 issue of Parents magazine. Thank you to all of our loyal viewers who wrote in and voted for us! We are constantly inspired by you to continue creating the products you and your babies love! Parenting Magazine, one of the largest and most respected parenting periodicals in the country, has chosen Little Laureate's first release as a MOM-TESTED VIDEO OF THE YEAR winner. The honor is considered to be the industry's highest award as it is based on the editors' own findings and their readers' feedback and not a for-profit awards program. Unlike other awards, there are no entry fees, submission guidelines or major studio and advertising backing. In fact, products cannot be submitted for the award at all. Each month, Parenting chooses the best new video releases to feature, and once a year selects the Video of the Year winners from that collection. According the Parenting magazine, the magazine's picks are evaluated by experts and Parenting's own editors, then reality-tested by the toughest critics out there: moms across the country. What did it take to make the list? The Parenting judges, including moms and kids, watched with the following in mind: Does the video hold a child's attention? Does it have a sense of humor? Only those products that have "something special -- an inspiring message for instance that parents could love earn the Mom-Tested! seal." As Parenting magazine wrote, "the answer for these winners is decidedly 'yes.'" Creative Child Magazine has just named Little Laureate's new "My World..." series the "2007 Media of the Year." 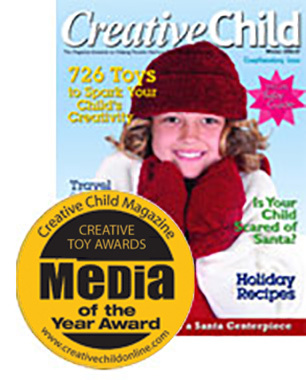 Creative Child Magazine is a national bi-monthly publication that provides parents with the latest information on how to nurture their child's creativity. 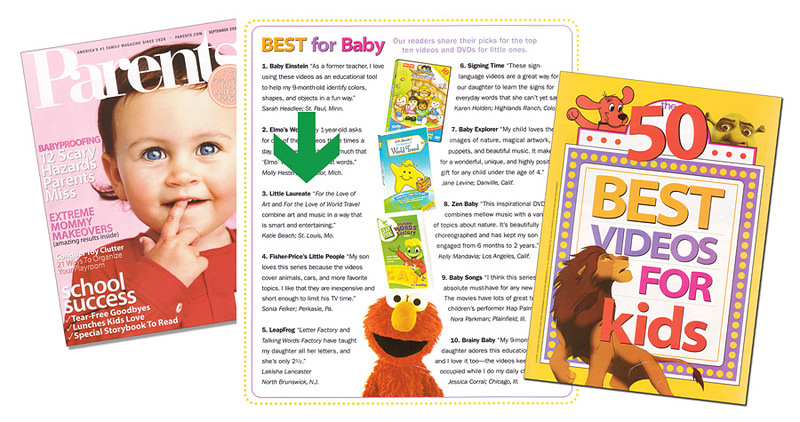 Little Laureate is very proud to have been recognized as one of Dr. Toy's "100 Best Children's Products" for 2007. "My World Gallery" was further honored by its inclusion in Dr. Toy's Best 10 Audio/CDs Category. "This new multimedia product presents interactive learning opportunities for children and adults. The series uses art as an educational touchstone to expose viewers to the world. Each title includes both a 30-minute interactive DVD and a CD with more than an hour of classical music. The first two titles are My World Gallery, a tour of over 500 years of the world's greatest art, and My World Adventure, a cross-cultural journey to each of the seven continents. "On the DVD, paintings come alive, synchronized with a fully orchestrated score that includes Mozart and Beethoven, allowing viewers to experience the rhythms, textures and patterns in the art and the music. Thoughtful connections are made between the art and the real world to further inspire young viewers. This is the first feature to offer a continuous onscreen learning guide for adults. Provides education, information and inspiration, as well as art activities for the whole family." Dr. Toy's 100 Best Children's Products Award recognized "My World Gallery" as a product that fit into the following categories: CD, Educational and DVD. Additionally, it was recognized for helping children to develop Cognitive Stimulation, Language, Visual and Recognition Skills. "Dr. Toy's 100 Best Products" were carefully chosen from among thousands that she has reviewed at toy fairs, in catalogs, and through many other sources, using extensive criteria she has developed over many years. Among the criteria used are: safety, age-appropriateness, design, durability, lasting play value, cultural and ethnic diversity, good transition from home to school, educational value, learning skills, creativity, improvement in the understanding of the community and the world, good value for price, and, naturally, fun. Parenting Magazine has chosen Little Laureate's first release for their "Parenting Picks" section that lists the best books, music and videos/DVDs of the month. Parenting writes that the Little Laureate presentation includes: "Eye-popping shapes and colors morph into masterworks, from Van Gogh to Warhol. Clips of real kids will entertain older sibs..."
Little Laureate has been selected as a Gold Award winner in the Video/DVD, Preschoolers, category of for both the 2004 and 2005 National Parenting Publications Awards (NAPPA) for Children's Resources. Now in its 14th year, NAPPA Children's Resources continues to be one of the country's most comprehensive consumer awards programs for children's products. NAPPA invites your entry for the best in children's books, toys, videos, music, and storytelling/spoken-word recordings. NAPPA is editorially driven and managed. The program evaluates products' lasting value and fundamental benefit to children. Entries are judged by a panel of distinguished reviewers, educators, editors and authors who are committed to helping parents select quality products for their families. Little Laureate Founder Heather was chosen as one of the "16 Best Entrepreneurs in America" by Sir Richard Branson and invited to accompany him on a 50,000-mile trip around the world. Their adventures were broadcast as part of Fox Television's "The Rebel Billionaire: Branson's Quest for the Best." Each week, Branson left one entrepreneur behind on the tarmac while the group jetted off to their next international location. The participants were not told if there was a final prize or what Branson was looking for in candidates, but each week Heather was invited to continue traveling with the billionaire until she found herself in the Final Four. She was invited with the other 3 finalists to stay on Branson's private Caribbean island, and actually asked by him to pick the ultimate winner. "As much as I wanted to win, or see a woman win, once I discovered that Richard was looking for his 'heir,' I knew no matter what my qualifications, that he was never going to announce to the world that heÂ’d found his doppelganger in a mother-of-two from the Midwest that makes baby videos," Heather says. "Especially when one of the other contestants was a wild-haired, daredevil guy with great family values and a cheeky company [Shawn Nelson of Lovesac], Richard's near double." While Heather cites leaving her children for 6 weeks as the hardest thing she ever had to do, she chose to pursue the opportunity with Richard Branson to show her kids that they can do anything. Heather's travels took her 50,000 miles around the globe, to 4 continents and 7 countries. Her adventures included a 300-foot free fall over Victoria Falls, repelling out of a Black Hawk helicopter in a Moroccan sandstorm, and being one of the first civilians to experience zero gravity aboard an experimental "space plane." She also secured a $20,000 grant to start a sustainable income source and bring fresh water to a poor South African village, and has since adopted Dumphries Village and school as an ongoing Little Laureate charity. Since she returned from her trip around the world, Heather is furiously at work, translating her experiences with the children she met into future products. Little Laureate Founder Heather Maclean was tapped by Sir Richard Branson of Virgin as one of America's "16 brightest entrepreneurs" and invited to join him on an epic journey around the world. 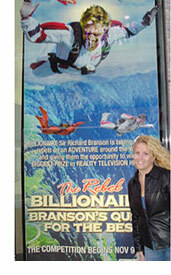 The adventure was taped and will air on Fox as "The Rebel Billionaire: Branson's Quest for the Best," premiering Tuesday, November 9, 2004. A self-made billionaire known for risk-taking, both personally and professionally, Branson whisked Maclean and 15 other business leaders around the world this summer to relive some of his personal experiences, tackling the types of dilemmas and life-or-death challenges that help shape future billionaires. If they succeeded, they continued onward. If not, each week, one entrepreneur was left behind on the tarmac as the rest of the group jetted off to the next adventure. Branson believes that a healthy corporate environment relies on teamwork rather than backstabbing. The participating entrepreneurs were not told if the show had a prize, so teams would work together and individuals would strive for their personal best, rather than try to cut each other down. The unscripted drama promises to raise the bar for the entire genre. It is the first show of its kind shot entirely in high-definition. A cross between "The Apprentice" and "The Amazing Race," the show also has a dash of "Fear Factor" and, surprisingly, The Peace Corps. Participants broke several world records and met with world leaders like Nelson Mandela. Little Laureate's latest release has been awarded the Seal of Approval and the highest 4-Dove rating from The Dove Foundation (www.dove.org). "There are lovely and gorgeous visuals that a child would enjoy seeing over and over again. The video is cleverly knitted together sans dialogue. I would recommend this for nursery schools as well as parents to enjoy watching with their young children. The wonders of the world: from the Lourve in Paris to South Africa, and the swinging rhythms of women dancing. This is a great alternative to cartoon watching." The Dove Family Approved Seal is awarded to movies, videos, made for TV movies and specials, web sites and other entertainment products that portray and encourage positive values. Advocating family values in entertainment for 12 years, The Dove Foundation advises over 50 million Americans on which products tell the kind of story family members can enjoy together with confidence. Little Laureate's first release was awarded the coveted 4-Dove Seal of Approval from The Dove Foundation (in comparison, Baby Einstein's latest release received just 3 Doves). "This video combines stimulating classical music, beautiful and colorful paintings, and simple shapes to create a smooth step-by-step connection between the three. This video provides children with an extensive amount of culture and stimulation at such an early age. It provides the viewer with the opportunity to explore their own imagination and get a small taste of that of the artists'. With each stroke of the brush, a new masterpiece takes shape and your senses are engulfed by beautiful color and sound. Movement, sound, color, and culture come together to create a stimulating and enjoyable masterpiece. This video also provides the viewer with the opportunity to see other kids making use of their creativity. This video was very well put together and it provided me with a chance to enjoy both art and music at the same time."